NB: I also do translations of french patterns into english. I need a scan or good digital pic (and permission from designer of pattern) and usually charge between $15 and $60 depending on length and complexity of the pattern. Contact me for a quote ! Why would you ever want to knit in french? 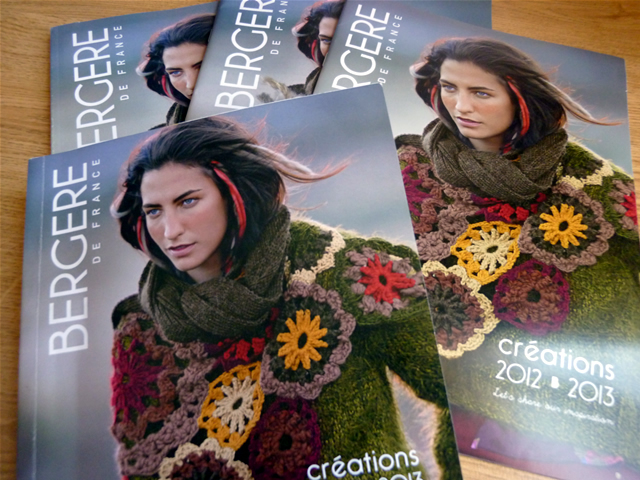 Even though knitting is nowhere near as popular and trendy in France as it is in North America these days, France still offers a variety of yarn companies and pattern makers that offer unique and mostly untranslated pattern books. The most famous are probably Berg�re de France and Phildar, but Bouton d’or and Anny Blatt enjoy a devoted following as well. Some of these companies offer a selection of free patterns online, offering a perfect opportunity to test your translation skills. When it come to wine and food, the French are famously wordy, but when it comes to knitting they are tighter-lipped. In French, « tricoter » (to knit) is just a generic term for the action of knitting, and doesn’t describe a precise stitch. In English, there is a specific term for each of the 2 basic stitches (knit/purl), in French you’ll be told to « tricoter � l’endroit » (literally knit on the right side) or « tricoter � l’envers » (knit on wrong side). To make matters worse, this will be abbreviated into the quite similar looking « m. endr. or m. env. ». You’ll just have to be very careful. Also, always keep in mind that the only system we have in France is metric. Therefore, all measurements will be in centimeters, and « aiguilles n°5 » will always mean 5 mm needles. French pattern often use a representation that looks like a math formula to note increases and decreases. Knitter’s who’ve worked with Japanese patterns will scoff at these but here’s an explanation. As a general rule, you’ll find first the number of times to repeat the action and next the number of stitches concerned by this action. Increase at each end – every 8th row : five times one stitch, – then every 6th row : nine times 2 stitches. Access the French Knitting Dictionnary for a translation of all the french knitting terms ! USEFUL LINKS: French free patterns. – Phildar. This famous french yarn store offers many free pattern in the “Mod�les tricot” section: move the cursor to 0€ to see the free knitting and crochet patterns for women and kids. – Plassard: you’ll find dozens of free knitting or crochet patterns on the site of this famous french yarn company.